Having spent 10 hours serving delicious teapigs brews to the Cheese and Cider festival attendees, there was enough time for 6 hours sleep before rising (with cheese hangovers) to head East for the Green Scythe Fair – episode 3 in the Real Tea Tour. Setting up at 10am there was a unique vibe with the tranquillity only briefly being interrupted by the sound of blacksmiths or stall holders pitching marquees. To raise environmental awareness through creative activities. To promote sustainable communities in South Somerset. To engage the local community in Green Issues. The early brews were poured for the security guards and stall holders before the gates officially opened at 11am. There were many families and many pleased looking dads who were in for an ideal Fathers day. The Fair was very child friendly and had many activities to keep them occupied in the various tipis and domes onsite including; puppets & storytelling, circus skills & craft activities (using clay, grass, wool, stone & willow), pedal powered scalextrics and a sand pit! Dotted around the site there were various stalls providing impressive displays of woodwork, thatching, blacksmithing, silversmithing, stone carving and lime plastering. There were also plenty of delicious local and organic food stalls too, refreshing local ales and ciders were all on tap for the part-time tea drinkers. From 2pm onwards the entertainment was provided by local musicians who performed on a stage powered by solar and wind powered generators. The day was a fantastic success and after the previous years event being a washout, there was minimal rain keeping smiles on the attendees and event organisers. 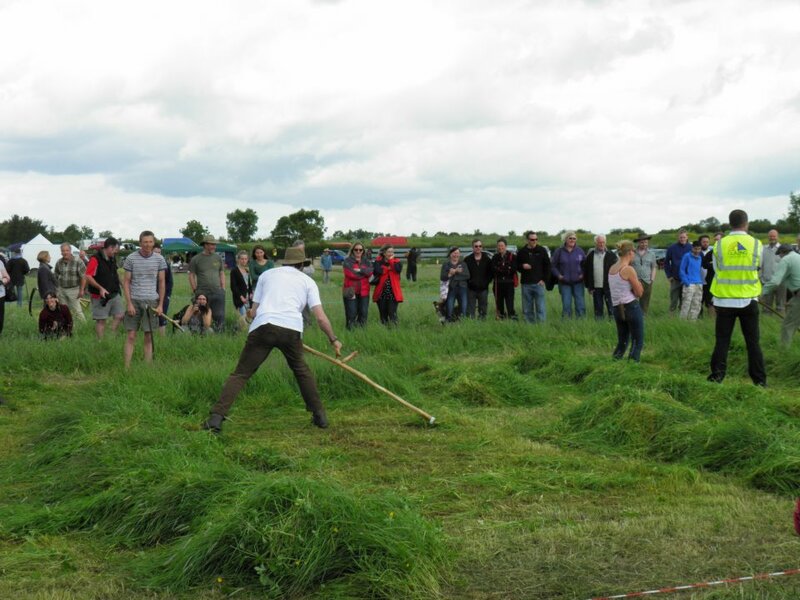 The Scythe competitions took place during the day with several of the competitors opting for a Matcha shot – keep your eyes peeled, it could be coming soon to a scything shop near you! Neither of us knew what to expect from the fair, to our naive minds a Scythe was a poor man’s lawnmower, in reality it is a REAL man’s lawnmower. The number of beards and chequered shirts was empowering, we felt like men amongst men! 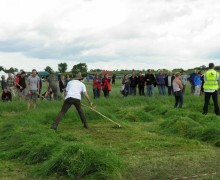 We will be back at Thorney Lakes soon for the 2012 Lowland Games and would love to be back there for the Green Scythe Fair in 2013. Next up on the Real Tea Tour is the Taunton Show!